On April 25, 2015, an earthquake with a magnitude of over 7.8M killed more than 9,000 people and injured more than 23,000 in Nepal. This is the first story in a series which highlights preparedness measures taken by every day individuals before the earthquake struck. For years, I knew that an earthquake was an “inevitable uncertainty” in the capital city of Kathmandu. This inevitable uncertainty became reality when the earthquake began shaking beneath my feet on April 25. One after another, the tremors continued. It was hard for me to believe that the earthquake was lasting so long with no end in sight. However, in the back of my mind, I knew I was prepared for such a catastrophic event because I had a Go Bag packed and ready to be used if I needed to evacuate. Not many people have Go Bags at the ready, unless they have had previous experiences with disasters or working in environments where the bag’s importance in promoted. However, because of my prior affiliation with the Red Cross movement, and having written an editorial regarding earthquake preparedness years ago for the Nepal Red Cross’s monthly magazine, I knew the importance of the Go Bag. I also had the privilege of receiving preparedness trainings at the American Embassy in Kathmandu, all of which led up to this moment. The moment I had my Go Bag ready. The moment I needed to evacuate my home. After the earthquake settled, I came outside the main entrance of my house and my wife emerged from the home with the Go Bag in hand. It was in the moment of rushed action that I had forgotten I even had the Go Bag! But my wife remembered, as she watched me over the years keeping my Go Bag up to date. That particular Go Bag had been waiting at the ready for one year and in that moment she was grateful I had taken the steps to create it. A Go Bag is something that is always referenced as standard preparedness for evacuation, though few individuals have one up-to-date and at the ready. For me, I used to be teased by friends and relatives who used to see my Go Bag by the exit of my home, as they questioned what was I doing, and why I was investing my time and energy into it. But now, they have come to realize its usefulness and how necessary it is to have one. Words cannot describe how useful the Go Bag became after the earthquake. My Go Bag not only helped my family and me, but also helped my friends and neighbors. The essential inclusion of clean drinking water became invaluable after the earthquake as access was limited. One of our neighbors cut his hand, and we were able to use the First Aid kit to apply antiseptic lotion to prevent infection. The Go Bag had everything we needed as we were comforted to know we had the necessary items should any challenges arise. Photo courtesy of Red Cross-EU Office. Nepali text overlay by Amod Bhattarai. 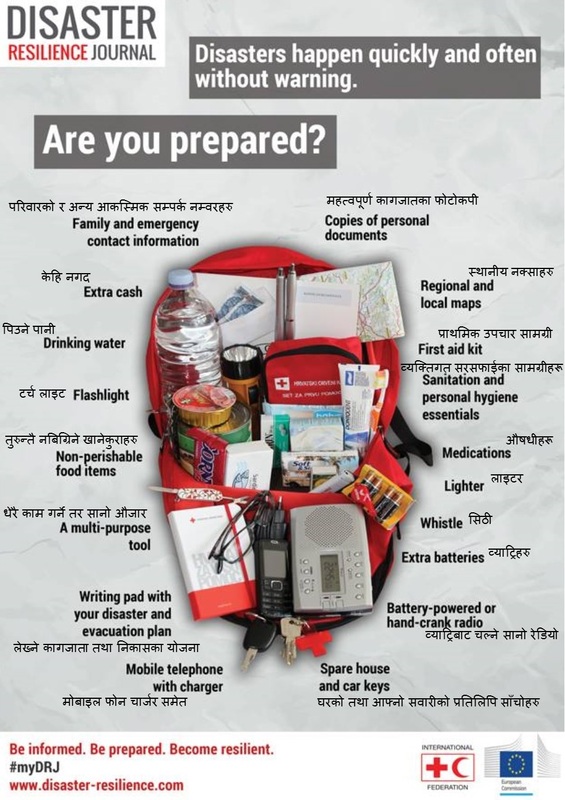 Every Nepali household should have a Go Bag ready to take with if evacuation is needed. Whether self-created, provided through training such as The Pillowcase Project, or through employers. Workplace trainings and institutional preparedness benefits individual and household preparedness and creates a culture of readiness in communities. Continue to keep your Go Bag up-to-date, and do not be discouraged if it goes unused.